Although it isn’t mandatory to wear one, bringing one along could help you sustain certain injuries. Layering up will allow you to stay warm, or cool off depending on the day. Try to purchase gear that is water and wind-resistant. Extra pairs of socks and gloves are always helpful. 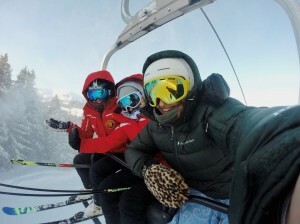 It’s safer to ski or snowboard with friends in case something happens! Stay hydrated and take breaks when you need. Be aware of your technique to help stay in control. Be mindful of others around you. If you think you can’t handle a slope, leave your skis or snowboard on and side step down the slope instead. If you’re tired, it’s probably time to stop. The skiers or snowboarders ahead of you have the right of way. Remember, when you are starting up downhill or merging, look uphill and yield first. Learn how to use devices that can help prevent any runaway equipment. Never go on a closed trail. Observe all signs and warnings. Use lifts safely, and if you don’t know how then ask! Following these tips will only make your skiing or snowboarding trip more enjoyable for everyone. Without safety, nobody is having fun, that’s why it’s important to educate yourself before hitting the slopes. Save Time With Direct Access PT! Should you suffer an injury, direct access for physical therapy can be an essential tool for your recovery process. Direct access gives patients the ability to seek physical therapy, without the need for a referral from a doctor or another healthcare practitioner. For more information regarding direct access, contact Farmingdale Physical Therapy East today! This entry was posted in Uncategorized and tagged sports injury rehabilitation in Farmingdale. Bookmark the permalink.